Namanya juga personal blog jadi isinya campur aduk. Kemarin saya pulang ke daerah kemudian kembali ke pinggir ibu kota sambil membawa buku buku yang belum sempat dibawa pada saat pindahan dulu. Pandangan saya tertuju pada buku BUKU PINTAR GRAMMAR LENGKAP. Dulu saat saya pacaran adalah merupakan hal yang tabu jika kentut sampai terdengar oleh mantan pacar saya. Begitupun mantan saya akan sangat malu jika pada saat berduaan tiba-tiba terdengar kentut. Pada saat berduaan dan tiba-tiba kepengen kentut karena ditahan sampai akhirnya tidak tahan lagi, justru terdengar sangat nyaring sekali. Sudah perut sakit ditambah malu lagi. Memang kita menyadari bahwa kentut siapapun pasti akan bau tidak terkecuali tamara bleszynski. Dua kata yang diulang berakhiran al dan ul, dalam bahasa jawa berarti sesuatu yang berulang-ulang pada frekuensi tertentu. Contohnya kental-kentul yang artinya bergoyang-goyang. Grothal–grathul, kata orang Jawa. Artinya belum lancar, masih mencoba-coba dan meraba-raba sampai mendapatkan kenikmatan untuk mengerjakan hal baru. Sama seperti saya yang baru mau akan mencoba WordPress. Posted on November 26, 2009 Author endarCategories Uncategorized15 Comments on Hello world! Lightning protection systems have changed drastically since Benjamin Franklin first invented lighting rods in 1752. Today’s systems must protect modern appliances, electrical systems and building constructions – they have to keep up with tile changing requirements of modern technology. Underwriters Laboratories Inc. (UL) keeps up with these changes. Our experience in the safety testing field has earned UL worldwide recognition and respect. jurisdictional authorities, government agencies, insurance representatives and consumers alike have looked for the UL Mark on products and systems for almost100 years. When you see the Mark, it means that the product or system on which it appears compares with UL’s internationally recognized Standards for Safety. In the lighting protection field, UL has been serving home and building owners since 1908. Today, UL has a large number of trained lighting protection field representatives located throughout tile United States. UL inspects sites ranging from cow barns to missile silos, front golf Course shelters to high-rise building systems. In fact, some of the most famous buildings in the world are protected by UL Master Labeled lightning protection systems, including the White House, the Sears Tower and the Washington Monument. Lightning can strike anywhere on earth – event the North and South Poles! In any U.S. geographical location, lightning storms occur as few as five times or as many as 100 times per year (see Fig. 1). -The Northeast United States has the most violent thunderstorms in the country because of the area’s extremely high earth resistivity (see Fig. 2). High earth resistivity (the earth’s resistance to conduct current) increases the potential of a lightning strike. If struck, structures in these areas will generally sustain more damage when there is no lightning protection system present. Some properties have a higher risk of lightning damage. When considering installation of a lightning protection system, you may want to assess this risk. A risk assessment guide for determining lightning loss for all types of structures can be found in Appendix I of the National Fire Protection Association’s Lightning Protection Code, NFPA 780. This guide takes into consideration the type of structure, type of construction, structure location, topography, occupancy, contents and lightning frequency. Information may be obtained from tile NFPA, I Batterymarch Park, Quincy, MA, 02269, (800) 344-3555. Lightning is the visible discharge of static electricity within a cloud, between clouds, or between tile earth and a cloud. Scientists still do not fully understand what causes lightning, but most experts believe that different kinds of ice interact in a cloud. Updrafts in the clouds separate charges so that positive charges moves end up at the top of the cloud while negative flow to the bottom. When the negative charge moves down, a “pilot leader” forms. ‘This leader rushes toward the earth in 150-foot discrete steps, ionizing a path in the air. 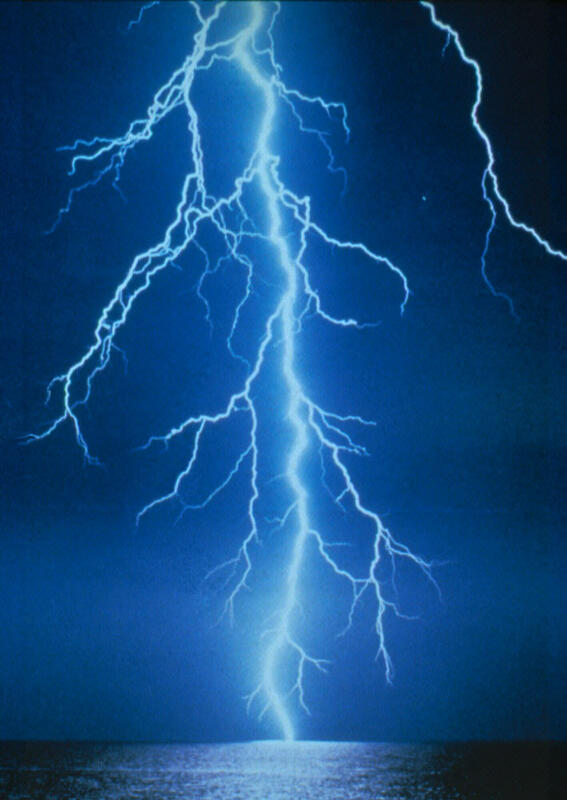 ‘The final breakdown generally occurs to a high object the major part of the lightning discharge current is then carried in the return stroke which flows along the ionized path. UL’s Master Label Program for lightning protection involves periodic factory testing and inspection of system Components, along with field inspection components of completed installations. The program requires that all installers comply with UL’s internationally recognized Standards for lightning protection components and systems. UL,’s field representatives countercheck compliance with these Standards. 1. Install a UL Master Label Lightning Protection System that complies with current nationally recognized codes. Lightning protection systems consist of air terminals (lightning rods) and associated fittings connected by heavy cables to grounding equipment, providing a path for lightning current to travel safely to ground. 2. Install UL Listed surge arresters at your service and telephone equipment to prevent surges from entering the home or other buildings oil power or telephone lines. Surges are diverted to ground, and both wiring and appliances are protected. h computers and other electronic equipment are connected in order to limit the voltage to 11/2 times the normal (maximum for solid state devices). 4. Look for the UL Mark. Remember, your lightning protection system may be installed using UL,’s requirements, but the system is not a Master Label system unless installed by one of UL’s Listed installers and a Master Label has been sent to you. Always “Look for the Master Label” on your lightning protection installation. What are the most common mistakes that English learners make? Which mistakes do most English learners need to correct, in order to learn English much faster? This is the biggest, most common, and worst mistake. Research shows that grammar study, in fact, actually hurts English speaking ability. Why? Because English grammar is simply too complex to memorize and use logically…. and real conversation is much too fast. You don’t have enough time to think, remember hundreds or thousands of grammar rules, choose the correct one, then use it. Your logical left-brain cannot do it. You must learn grammar intuitively and unconsciously, like a child. You do this by hearing a lot of correct English grammar- and your brain gradually and automatically learns to use English grammar correctly. Both English students and teachers try to force speech before the learner is ready. The result is that most students speak English very slowly- with no confidence and no fluency. Forcing speech is a huge mistake. Don’t force speech. Focus on listening and be patient. Speak only when you are ready to speak- when it happens easily and naturally. Until then, never force it. Unfortunately, most English students learn only the formal English found in textbooks and schools. The problem is- native speakers don’t use that kind of English in most situations. When speaking to friends, family, or co-workers, native speakers use casual English that is full of idioms, phrasal verbs, and slang. To communicate with native speakers, you must not rely only on textbooks.. you must learn casual English. Students and teachers often focus on mistakes. They worry about mistakes. They correct mistakes. They feel nervous about mistakes. They try to speak perfectly. No one, however, is perfect. Native speakers make mistakes all the time. You will too. Instead of focusing on the negative- focus on communication. Most English learners rely totally on schools. They think the teacher and the school are responsible for their success. This is never true. You, the English learner, are always responsible. A good teacher can help, but ultimately you must be responsible for your own learning. You must find lessons and material that are effective. You must listen and read every day. You must manage your emotions and remain motivated and energetic. You must be positive and optimistic. No teacher can make you learn. Only you can do it! While these mistakes are very common, the good news is that you can correct them. When you stop making these mistakes, you change the way you learn English. You learn faster. Your speaking improves. You enjoy learning English. Good luck… you can do it!